With over 15 years of experience I have not seen SQL databases in source control. Sometimes it's a business requirement to track changes in code for auditing purposes. Using source control has many benefits I'm not going to list out here, but the issue is how to recreate the database (including data) from source control files. Announcing the launch of my SQL deployment utility website SalsaOnChip. The idea behind SQL Deploy Manager (SDM) was to automate the deployment of databases while utilizing the power of source control. The majority of software developers use some form of source control. It’s an almost vital part of developing software on your own or in a team. Writing your own SQL scripts or exporting the objects from an existing database is straightforward. Those scripts can be added to source control too. 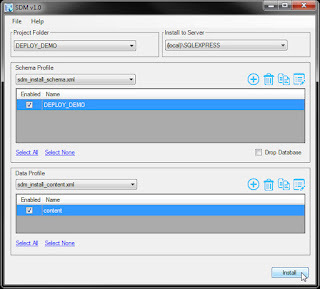 SDM was designed to be a simple out of the box solution to automating the recreation of your database. This flexible utility has saved me hours of moving a databases from development to testing and to multiple production environments. Please visit http://www.salsaonchip.com/ for more information and to download a demo. I appreciate any feedback.